BANGI, 9 April 2014 – Winning many prestigious medals all over the world is not the benchmark for the success of innovation and research since the acid test for the discoveries are the products made available in the market place. 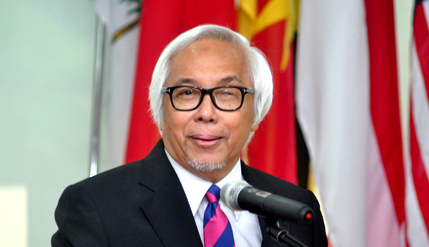 Science Advisor to the Prime Minister Prof Emeritus Dato’ Sri Zakri Abdul Hamid said millions of dollars has been spent on research in universities but there is difficulty to name even one research based product. Giving his keynote address at The National University of Malaysia (UKM) 14th Postgraduate Colloquium here today he said only 5% of the Research and Development products funded has been commercialised. He said science and technology is not judged only by the efforts of the scientists and their discoveries as the political masters judge science and technology in terms of how many jobs can be created and how it will change the well-being of the people. The two days colloquium saw over 70 papers presented in various field from Food Science to Nuclear Science. Prof Zakri said universities needed to relook at their relationship with the private sector so that there will be early interaction. He said the private sector also needed to give the same attention to R&D as they give to profit and loss lamenting that their mindset of being interested only in their bottom line will make the country stay as a developing country forever. The private sector needed to invest in R&D continuously, that is where the big money is, he said. Prof Zakri gave an anecdote told to him by his friends abroad which summarizes the current situation of science and technology in the country. He said that is the price we pay if we do not innovate and add value to our existing technology. Prof Zakri also said another reason why Malaysia is lagging in terms of science and technology is the lack of understanding between universities and the industry. Universities have to understand the needs of the industry and knowing the most pressing problem that needed to be solved and then come up with a technological solution. He said government linked companies (GLCs) and SMEs needed to venture into potential growth areas where the returns on investment are multifold. Present at the talk was Vice Chancellor Prof Datuk Dr Noor Azlan Ghazali, Dean of the Faculty of Science and Technology, Prof Dr Sharim Hj Ahmad, lecturers and students.